Despite offering a positive take on Murray’s situation, Bryan recognises the Scot’s situation is completely different. “I feel great, quality of life is great, practises are going well,” he said. “Maybe I’m not 100% yet, but I’m only five months since surgery. The doctors said it will be more like seven or eight months until you feel perfect. “I never once told him this is the way to go because singles is a different monster. “Those guys are sliding around, killing themselves for four hours. Who knows if this joint would hold up. “Will you have the explosiveness to be quick on the singles court? If you don’t have that, you’ll be exposed. Bryan has recommended his surgeon Dr Edwin Su, who is based in New York and has successfully performed the procedure on a number of American athletes. Bryan says Murray has already spoken to the doctor. “He’s the only guy that’s got professional athletes back to their profession,” Bryan said. Mum Judy said it had been tough watching her youngest son struggle with injury. 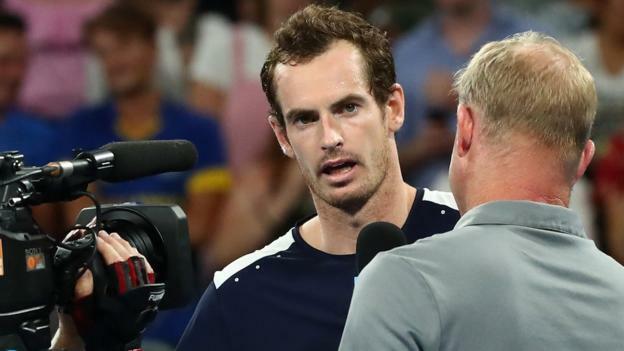 “The hard thing, for all of us around him, is to have seen him in pain on a daily basis, doing regular things,” she told BBC Radio 5 live’s Tennis Breakfast. “It’s not even the playing of the sport – it’s simple things, like tying his shoelace, things we take for granted. Jamie, who starts his Australian Open doubles campaign on Thursday, praised his younger brother’s spirited performance in his emotional five-set defeat by Bautista Agut. “I knew how difficult it was for him because of the pain he’s in and also the frustration of not being able to play to the level that he’s used to or expects of himself,” said the 32-year-old. “If it does happen to be the last time he plays here, it’s a great way for him to go out and show everyone what a fighter he is. “I just hope that, whatever happens, he can get back to just regular life, pain-free, and be able to enjoy himself and not be in constant pain. “If he’s able to come back and play tennis, if that’s what he wants to do, then I’m sure he’ll give it everything he can. “But I know obviously, surgeries, so many other things he has tried to do in order to get back and get feeling good.